Nobleman, writer, adventurer and inspiration for the swashbuckling gun runner in the Adventures of Tintin, Henri de Monfreid lived by his own account “a rich, restless, magnificent life” as one of the great travelers of his or any age. The son of a French artist who knew Paul Gaugin as a child, de Monfreid sought his fortune by becoming a collector and merchant of the fabled Persian Gulf pearls. He was then drawn into the shadowy world of arms trading, slavery, smuggling and drugs. Infamous as well as famous, his name is inextricably linked to the Red Sea and the raffish ports between Suez and Aden in the early years of the twentieth century. De Monfreid (1879 to 1974) had a long life of many adventures around the Horn of Africa where he dodged pirates as well as the authorities. In ADVENTURES OF A HASHISH SMUGGLER, de Monfreid, who was not particularly law-abiding by nature and was essentially a professional gunrunner, tells the story of his one foray into the world of hashish smuggling during the 1920s. The source of the hashish was Greece, where hemp was openly grown. The market was Egypt, where the British government had banned the popular drug. When de Monfreid got the notion of going to Greece to purchase hashish to smuggle into Egypt, he didn’t even know what hashish looked like. De Monfreid arranged to have 600 kilos of hashish brought from Greece to Marseilles and then into Djibouti, a French colony. From there, he sailed with it in his own “boutre” or dhow and a loyal crew of natives (assembled when he had run the pearl-diving operation) up the Red Sea to Suez, from where the shipment was carried on to Cairo by camel caravan. Along the way de Monfreid had several close calls and met a number of colorful characters. Shortly after de Monfreid’s venture, the Greek monarchy was turned out and the Second Hellenic Republic was declared. Under strong pressure and with economic inducements from Great Britain, the new Greek government outlawed the production of hashish. 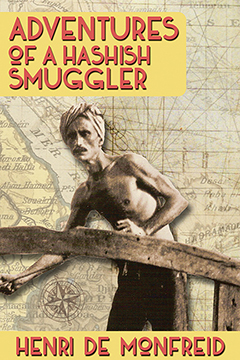 ADVENTURES OF A HASHISH SMUGGLER By Henri de Monfreid, translated by Helen Buchanan Bell. 294 Pages. 6x9 Paperback. Illustrated.